After launching Cloudbreak on AWS, you are required to select one way for Cloudbreak to authenticate with your AWS account and create resources on your behalf: key-based or role-based. While key-based authentication simply uses your AWS access key and secret key, role-based authentication uses IAM roles. 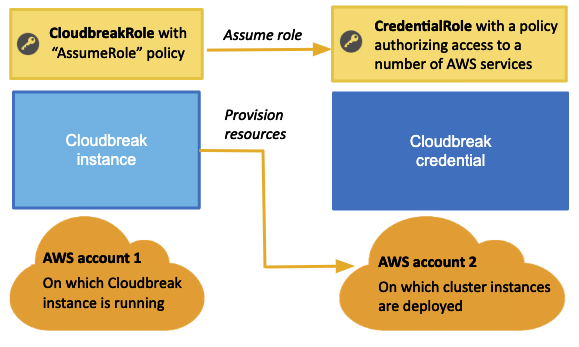 If you are using role-based authentication for Cloudbreak on AWS, you will eventually create two IAM roles: one to grant Cloudbreak access to allow Cloudbreak to assume AWS roles (using the AssumeRole policy) and the second one to provide Cloudbreak with the capabilities required for cluster creation (using the CbPolicy policy). The AWS account 1 and AWS account 2 presented in the diagram can be the same account. CloudbreakRole Allows Cloudbreak to assume other IAM roles - in this case Cloudbreak will assume the CredentialRole. Create a role called CloudbreakRole and attach the AssumeRole policy. As part of Cloudbreak installation process, attach the CloudbreakRole IAM role to the Cloudbreak VM. Create the IAM role and policy in the AWS IAM console. Attach the IAM role to the VM in the EC2 console. CredentialRole Authorizes Cloudbreak to create AWS resources, such as VMs, required for clusters. Prior to creating a Cloudbreak credential, you must create an IAM role called CredentialRole and attach the CbPolicy policy to it. When creating a role-based Cloudbreak credential, provide the IAM Role ARN of this role toCloudbreak. Create a role-based Cloudbreak credential in the Cloudbreak web UI. These role and policy names are just examples. You may use different names when creating your resources. Alternatively, instead of attaching the CloudbreakRole role during the VM launch, you can assign the CloudbreakRole to an IAM user and then add the access and secret key of that user to your Profile. Alternatively you can generate the CredentialRole role later once your Cloudbreak VM is running by SSHing to the Cloudbreak VM and running the cbd aws generate-role command. This command creates a role with the name “cbreak-deployer” (equivalent to the CredentialRole). To customize the name of the role, add export AWS_ROLE_NAME=my-cloudbreak-role-name (where “my-cloudbreak-role-name” is your custom role name) as a new line to your Profile. If you choose this option, you must make sure that the CloudbreakRole or the IAM user have a permission not only to assume a role but also to create a role.